Once again Sigerson paints a most vivid pen-picture of one of Cahersiveen's famous sporting occasions. The meeting is one of the oldest in Ireland and was first held in 1852 on land in Reenrusheen bequeathed to the people of the town by the Liberator, Daniel O'Connell (1775-1847). They have taken place every year since and are now a two-day event in August. Sigerson's own notes on this reads - Steve 'Crusher' Casey: a wrestler from Sneem, Co. Kerry who became a world champion. 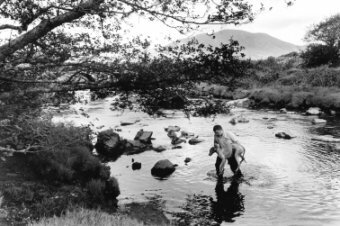 Dilisc: edible seaweed; Crubeen: a pig's trotter; Peg's Leg: brown-coloured sugar-sticks; Fertha: a river in South Kerry; Medium: a measure varying from a half-pint to a pint but nearer to a pint. Rich man and poor man, wild boy and tame fool. On the day of the races in Cahersiveen. To push through the crowds packed like peas in their pods. And sweep like the wind east by Reenrusheen tide. And shouted their praises while time did allow. Ye're the pride of the races in Cahersiveen." But the hooves of the horses beat loud in my head. And the splendid horse races in Cahersiveen.